One Port Vale goal was enough to condemn Crawley to a third consecutive league defeat in a week as their form continued to take a turn for the worse on Saturday. Here are five things we learned from Reds' display. Crawley's form is definitely a cause for concern at the moment. They are looking over their shoulder at the wrong end of the table and need to start picking up points. Port Vale, who sat four points below Crawley in 19th place before yesterday's game, would have been a team short of confidence before travelling to the People's Pension Stadium after a 3-0 home defeat against Colchester. It was a very winnable game for Reds against a team who have scored the joint least amount of goals in the league (27), but Gabriele Cioffi's side rarely troubled The Valiants. A promising start under Cioffi's reign gave fans hope of a promotion challenge, but too many players are out of form, and suddenly they face a battle in the bottom half. The main problem for Crawley is their form away from home. 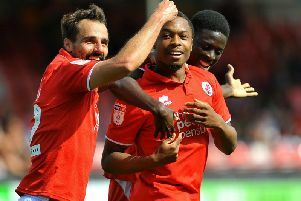 Cioffi watched on from the stands as Reds beat top-of-the-table Lincoln the day after he was named as Harry Kewelll's successor, but since he took charge his side have failed to win on the road in ten attempts (nine defeats and one draw). Crawley had prided themselves on their formidable home form after Cioffi took over, with five consecutive wins on home soil in all competitions, with Morris saying at the time that it was 'becoming a fortress'. However, the inevitable pressure their dire away form has put on their home form, has seen them win just three of their last eight league games at home. I do agree with Glenn Morris that only fine margins are the difference at the moment and form can change with just one win, but with two tough trips to 11th placed Swindon and second-placed Bury, Crawley face a battle to change their fortunes. No one would disagree that Ollie Palmer and Filipe Morais were not at their influential best yesterday afternoon following suspension and injury respectively. The pair are Crawley's standout outfield players when on form and have made a huge difference so far this season, but did look a yard off the pace against Port Vale. That, arguably, is the main reason why Crawley rarely threatened. Morais was clearly not 100 per cent fit, making only his second start since November 20. He missed a glorious chance to open the scoring, and wasn't as involved in the game as he has so often been since signing for the club. Club top scorer Palmer, meanwhile, showed some good hold up play, but had a poor game by his standards. He struggled to get into the game and had no chances of note. Crawley will need both players to get back to their best if they are to get their season back on track. On a positive note, Tom Dallison looked promising in his first home game. The centre-half looked confident on the ball and wasn't afraid to play out from the back. He will provide some much needed depth in defence, and provides a composed head alongside the no messing Mark Connolly and Bondz N'Gala. He was well worthy of his man of the match award, but if you did have to pick out one criticism it would be his defensive positioning, as he left Ricky Miller completely unmarked in the build up to the opener. That defensive nous of knowing where to be will come with time for a player who looks to be a smart buy. Crawley may not have had an abundance of chances against Port Vale but for the first 25 minutes, they looked the most likely to take the lead. An early effort from Morais was so close, it had fans celebrating, before they quickly realised the ball had narrowly gone wide of the post. Shortly after, Dominic Poleon found himself through one-on-one with the goalkeeper and looked dead set to score, but he also placed it wide of the woodwork. It isn't the first time this has been the case for Crawley, but they were definitely made to pay for those missed chances, which proved to be pivotal in their defeat. Following Port Vale's goal, Reds rarely threatened until the introduction of tricky forwards Luke Gambin and Ashley Nathaniel-George. Although they couldn't force an equaliser, it wasn't for the lack of trying and should both start the next game. Changes are definitely needed.